Revised plans for a smaller new village hall and community centre for Congresbury are being drawn up to help offset rising costs. 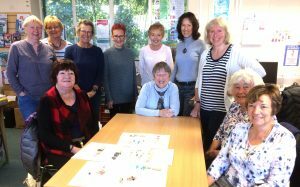 The Congresbury New Village Hall Development Trust has been working with architects Stride Treglown on reducing the footprint of the proposed building, first mooted in late 2013. 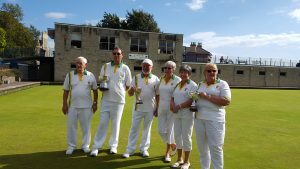 Four of the seven finals at Clevedon’s annual bowls tournament were contested by Congresbury bowlers. Clive Shipway and Roger Becker won the men’s pairs and Chris Wilcock, Jenny Byett and Angela Jones won the ladies’ triples. Dave Byett was runner-up in the men’s singles and Pat and Barry Baker were runners-up in the mixed pairs. 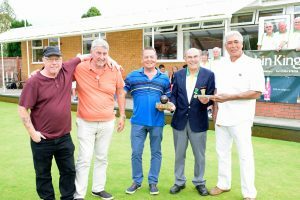 The annual Sportsmen’s Day, organised by the village bowling club, attracted more than 100 novice bowlers in a day-long tournament. Winners were the Cleeve Cricketers – Terry Barter, David Lock, Mike Wilkinson and Jeff Rawles. Second was the Bash Street Gang – Ian and Joe Crane, Chris Luke and Johnny Matthews. Third was Yatton Gasheads – Ivor Watts, Stephen Lovell, Phil Arnold and Porsche (correct) Eade. Fourth was the Cottage Loaf – Keith Westlake, Richard Aldridge and Pete and Glynis Woodhouse. Bowls club president Don Manning presented the prizes. The event was sponsored by Robin King Estate agents and Butcombe Brewery. 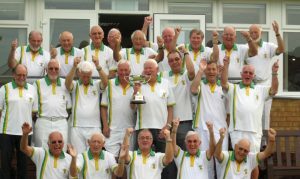 Congresbury Bowling Club president Don Manning presents Cleeve Cricketers with their trophy and prize money after winning this year’s annual Sportsmen’s Day tournament. Ben Payne is only 8 years old but is raising awareness and fundraising for the amazing Make-a-Wish Foundation. This summer, he and his Les Paul guitar are going to be playing some tunes on Facebook. He has already recorded and broadcast two songs and so far raised over £100. He plans to “facebook busk” a number of times before heading back to school at St Andrews. He has been asked to perform at The Strawberry Line Cafe’s “Platform One Fest” on Friday 11th August and to perform at “Busk in the Sun” in WsM over August Bank Holiday weekend. We wish him the best of luck. 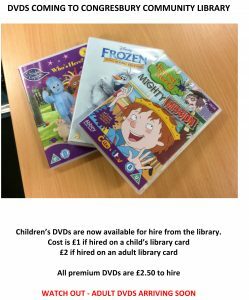 For more information visit his Facebook page by clicking here. Members of the Neighbourhood Watch scheme are invited to contact the Avon and Somerset Neighbourhood Watch Association and start the discussion around the fantastic opportunities they could bring to further develop the partnership between local policing teams and NHW. 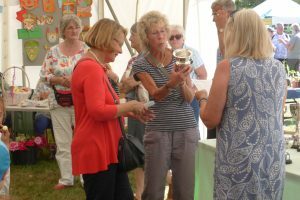 Jonquil Brooks receiving the Darke cup from President, Ann Gunner, for the most points in the flower arranging classes at the 2017 Summer Flower Show last Saturday. Her charming miniature arrangement in a seashell and her exhibit in a kitchen utensil. Her superb quilt, in a blue star design, was judged the best handicraft entry. 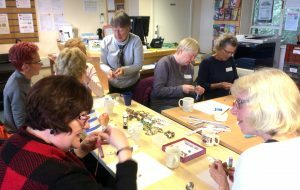 On Wednesday 19th July, in Congresbury Refectory, well known naturalist and wildlife photographer, Higgy, will talk about wildlife on Congresbury Moors and how to attract wildlife into your own garden. 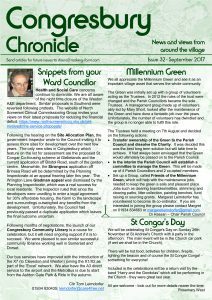 The Village Fete – a good time had by all!! 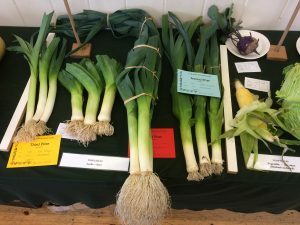 It had everything for a perfect village fete – sublime weather (sunny, but not too hot), lots of people (old and young), plenty of dogs (but no dog fights), interesting variety of stalls and a good range of food and drink. 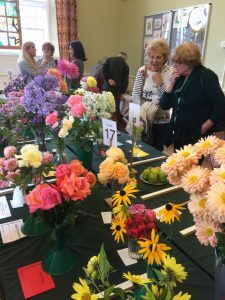 Villagers swarmed into St. Andrew’s church paddock to trawl the stalls, watch the dog show, partake of cider or Pimms, eat at the barbecue, and enjoy scrumptious home-made cream teas and cakes. The marquee housing the Horticultural Society’s summer show was a riot of colour and perfume, with many outstanding exhibits and excellent children’s entries. CRAG has responded angrily to a planning inspector’s call for North Somerset to provide sites for 2,500 houses over the next few years. The inspector had been looking at the council’s Site Allocation’s Plan, which sets our housing needs to reach North Somerset’s housing target. But because the inspector did not accept that North Somerset could deliver the required number, she has asked the council to identify the housing sites for “up to 2,500 dwellings”. 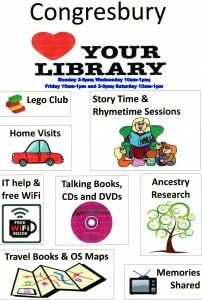 Congresbury Community Library is holding weekly craft activities for children every Monday 2.30pm – 4.30pm from July 24 – August 21st during the school holidays.